With the occurrence of the spring equinox, there are many cultural and religious celebrations of life, renewal, bounty, and freedom. Over 300 million people celebrate the Persian festival of Nowruz. In South Asia, there are festivals for Chaitra Sukladi, Ugadi, Gudi Padava, Chetti Chand, Navreh, Sajibu Cheiraoba, and more. Pagans celebrate Ostara. There will be Easter egg hunts and Passover Seders. In Washington, DC, celebration of the National Cherry Blossom Festival began on March 20 and continues through April 12. Noting, and celebrating, the timing of cherry blossoms in DC is a tradition that originated in Japan. The DC Festival commemorates the friendship between the US and Japan that was symbolized by a gift of 3,000 cherry trees from Tokyo’s mayor in 1912 to our nation’s capital. The cherry blossoms in Kyoto, Japan are perhaps the oldest example of a spring tradition that has proven useful to climate change research. For centuries, the exact timing of annual cherry blossom festivals varied depending on the peak flowering of Japanese mountain cherries, which in turn varied depending on the warmth of the weather. Because the festivals were timed to coincide with peak blooms, and the timing of blooms were tied directly to spring temperatures, scientists can now estimate past spring temperatures based on timing of historic festivals. Good records of the festival dates go back to the 15th and 16th centuries, and some, though less complete, records go back as far as the 11th century. In addition to old traditions of noting when flowers bloom, there are traditions of noting when birds and insects arrive on their migration, when insects emerge, and a host of other observations about the timing the spring. Instead of festivities and dancing around maypoles, in citizen science projects, the traditions involve following field protocols. Either way, it is time to notice the natural world during a change in season. As more cultural traditions to connect with nature seem to lost over time, citizen science is filling those gap with scientific hobbies. Spring citizen science is the theme for the March #CitSciChat, a monthly Twitter chat session co-sponsored by SciStarter and the NC Museum of Natural Sciences. Join us for the March #CitSciChat on Wednesday March 25, 7pm GMT, which is 3pm ET in the US. Follow our March guest panelists who represent a variety of projects relevant to tracking spring, including the Migratory Dragonfly Partnership (@Dragonfly_MDP), Journal North (@journeynorthorg), Operation Rubythroat (@rubythroat1), the Monarch Larva Monitoring Project (@MLMPCitSci), BudBurst (@PBudBurst), eBird (@Team_ebird), and Snapshot in Time (@OrianneSociety). We’ll discuss springtime scientific discoveries, education lesson plans, best practices for project design, and what’s on the horizon for citizen science. The next time you get into an argument with your laptop or shake a fist at your computer, try to refrain from calling it “a stupid machine.” That would be gloating. We really are more intelligent than our computers. Case in point, the human mind can solve puzzles better than computers. On this principle, using game elements in citizen science, called gamification, is a popular approach in biology. That's the topic of the next #CitSciChat on Twitter. The next time you want to argue against a group, think twice. Groups can be more intelligent than individuals. On this principle, some game elements often involve creating teams that compete against each other. Within group cooperation, in the context of competition across teams, is a powerful motivator. For example, figuring out DNA configurations presented researchers with problems that were computationally too intensive for a single computer. At first, molecular biologists looked for a solution with a type of citizen science called distributed computing. Volunteers help research by donating their unused CPU (Central Processing Unit) and GPU (Graphics Processing Unit) cycles on their personal computers to causes like Rosetta@Home and Folding@Home. At the cellular level, human minds are important again. One doesn’t have to be a trained pathologist to identify cancer cells and help find biomarkers in these cells. Cancer Research UK takes games very seriously. In their newest game, Reverse the Odds, players identify bladder cancer cells before and after different treatments, which will help future patients know whether their best odds are with surgery or chemotherapy. Why are people better than computers at protein-folding puzzles? Why is the human mind better than computer algorithms at figuring out how DNA regions align? Why is the trial and error approach of people better than formal techniques and alogrithms of bioengineering RNA? Why are teams smarter than individuals? Why is gamification so popular that, when the online game Phylo launched in 2010, the computer servers crashed, unable to handle the volume of thousands of simultaneous players? Why are there over 37,000 people working (meaning playing) at RNA design puzzle in an open, online laboratory called EteRNA? For answers to these questions and more, join us for the next citizen science Twitter chat by following the hashtag #CitSciChat. The #CitSciChat are co-sponsored by SciStarter and the North Carolina Museum of Natural Sciences. Anyone is welcome to join with questions, answers, comments, and ideas. Don’t be shy and don’t forget to include the hashtag #CitSciChat so that others in the conversation don’t miss your Tweets. I will Storify each session and post the recap on this blog. Vickie Curtis (@Vickie_Curtis), who received her PhD at Open University where she investigated gamification in citizen science. Next week she begins with the Wellcome Trust Centre for Molecular Parasitology at the University of Glasgow. Phylo, nanocrafter and FoldIt were featured in a recent SciStarter newsletter, check out the rest of the projects here and sign up for the newsletter on the SciStarter homepage to get to know about more. Citizen science chats take place on Twitter at #CitSciChat the last Wednesday (Thursday in Australia) of every month, unless otherwise noted. To involve people across the globe, chats take place 7-8pm GMT, which is 2-3pm ET in USA and Thursday 6-7am ET in Australia. Each session will focus on a different theme. To suggest a project or theme for an upcoming chat, send me a tweet @CoopSciScoop! The inaugural conference of the Citizen Science Association (CSA) is next week, just prior to the meeting of the AAAS (American Academy for the Advancement of Science). Both conferences will be held in San Jose, California. The CSA conference reached its attendance limit quickly and had to turn people away. The line-up of presentations shows attendees from a high diversity of disciplines, countries, and perspectives coming together, making this is a milestone event for citizen science as a discipline. 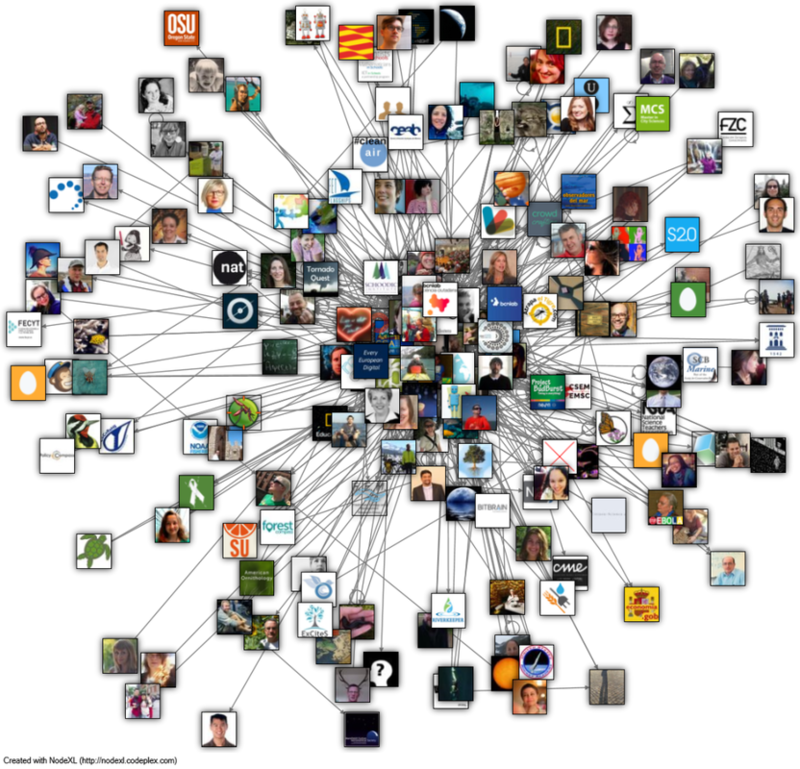 In last week’s #CitSciChat, the citizen science community had a face-paced discussion on Twitter. As moderator, I asked several questions, including "Q8. What are hoped for outcomes of the upcoming conference of the Citizen Science Association?" Here is a brief summary. Answers covered several themes. One important theme focused on building an equitable and inclusive community. Encouraging the CSA to walk the walk reflects the desire of citizen science practitioners to have their Association embody the same values they promote in their citizen science projects. It appears that the membership of the CSA is committed, to paraphrase Abraham Lincoln, to ensuring that science of the people, by the people, for the people, shall not perish from the Earth. 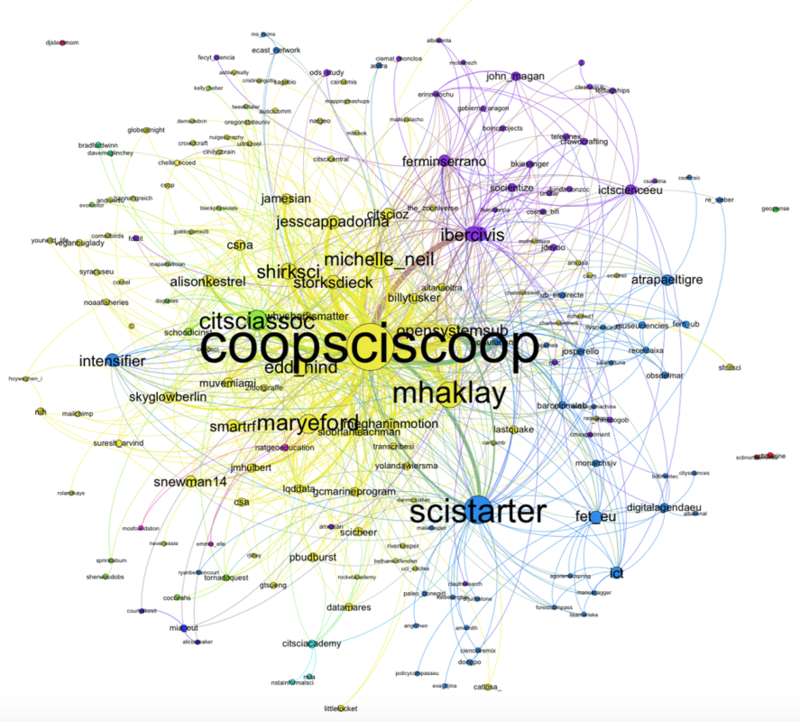 Another theme was related to networking and Tweeters mentioned their hopes to find synergies, connect local and global projects, talk across disciplines, and form new partnerships that will advance the field of citizen science. Some Tweeters had specific ideas about the types of directions they hope the CSA conference will spark, including bridging a perceived divide between life and environmental sciences, understanding how to measure project outcomes, and developing projects that engage people in more than data collection. A final theme was related to having fun, making friends, and meeting people in person that they only knew via Twitter or email. In further preparation for the Citizen Science Association’s conference next week, @johannavarner of the @CitSciAssoc Conference Communications Working Group started a hashtag #WhyICitSci. Use the hashtag and share why YOU love citizen science and what motivates you to be a part of citizen science. The #WhyICitSci campaign is a great Twitter pre-conference icebreaker to help us get to know each other before we gather in San Jose! A few days ago was the first #CitSciChat, sponsored by SciStarter and my lab (The Counter Culture). The #CitSciChat was a fast-paced and exhilarating hour of citizen science discussion. Guest panelist and many others carried out a lively conversation structured around questions that I posed over the hour. Twitter chats have a hilarious side because so many people can chime in at once, which creates a kind of crazy that we rarely do in person. It is near impossible to follow all the discussion, especially in the moment, but in the calm after the Twitter storm, it is easy to go back to the #CitSciChat stream or read a capture of the majority of tweets created in Storify. I'll summarize a little here. What disciplines are involved in citizen science? Within a few more minutes, we had this list: economics, deciphering handwriting, ecology, biology, social science, GIS, fisheries, education, arts, linguistics, geography, biochemistry, genetics, oceanography, physics, biotechnology, humanities, environmental monitoring, policy making, ethics, weather monitoring, ecology, environmental sciences, astronomy, geology, medical science, marine science, water quality, human-computer interactions, human health, seismology -- Transdisciplinary! And it was noted - not chemistry. I asked the Chatters about the pros and cons of associations. The quickly listed the following pros: democracy, visibility, efficiency, pervasive sci literacy, global, share, collaborate, network, respect and promoting citizen science, resources, collective learning, transparency, sustainable long-term communities. And the following cons: top-down, self-interest, hard to be global, echo chamber, me toos, can exclude volunteers, no longer novel to funders, over-professionalizing, don't silo citizen science from science. (Elsewhere, I'll summarize the Chatters hoped for outcomes of the upcoming CSA conference). My favorite part was to learn what Chatters thought were the promising frontiers, and these included wearable citizen science, digital arts, collective intelligence, neurodata gathering, new societal values, the internet of things to generate data, dedicated funding lines for citizen science, projects sharing platforms and technologies and protocols, mobile tech, greater access globally, connecting silo'ed and distributed but related data, neurosynapitc processors, improved policy making, and sensor networks for biodiversity. Thanks again to all who were involved. Try to find your profile picture below. I hope you'll jump into the February (25th) #CitSciChat too! Starting this month, you can tune in and take part in monthly discussion sessions about citizen science. The discussions take place on Twitter and anyone is welcome to join with questions, answers, comments, and ideas. You can follow the discussion at the hashtag #CitSciChat. The monthly #CitSciChat are sponsored by SciStarter and The Counter Culture, which is my new research lab at the North Carolina Museum of Natural Sciences. These Twitter chats are designed to bring citizen scientists, project managers, students, and scientists together to share ideas, knowledge, and resources. We’ll discuss news, policies, discoveries, papers, and projects. The chats are opportunities for people around the world to meet and share their experiences with citizen science. Whether you are experienced with Twitter or new to the network, I hope you will find it easy to take part. Here’s how it works. I’m the moderator (@CoopSciScoop) and for each session I will invite a few guests with varied expertise, who enjoy lively discussions. I’ll pose question (Q1, Q2, etc.) and guest panelists and others will answer (prefaced with A1, A2, etc to save space). Others can answer too, and pose related questions (label them, e.g., Q1a, Q1b, etc). There are no expectations that everyone will agree, but there are expectations that everyone be courteous, polite, and respectful. Know that it’s okay to simply follow along, but don’t be afraid to enter the conversation. Most important, don’t forget to include the hashtag #CitSciChat so that others in the conversation don’t miss your Tweets. I will Storify each session and post the recap on this blog. The #CitSciChat follows in the footsteps of many other Twitter chats. For example, there are Twitter journal clubs, such as #microtwjc for discussions of microbiology papers (initiated by @_zoonotica_). There are chat sessions like #StuSciChat that connects scientists and high school students (moderated by Adam Taylor @2footgiraffe) and #STEMchat that connects parents, educators, and STEM professionals (moderated by Kim Moldofsky @MakerMom). A very popular #Edchat founded by Shelly Sanchez Terrell (@ShellTerrell), hosts conversations among educators. Citizen science chats take place on Twitter at #CitSciChat the last Wednesday (Thursday in Australia) of every month, unless otherwise noted. The January session will be on the 28th (29th in Australia). We'll increase in frequency depending on the interest levels. To involve people across the globe, chats take place 7-8pm GMT, which is 2-3pm ET in USA and Thursday 6-7am ET in Australia. Each session will focus on a different theme. To suggest a project or theme for an upcoming chat, send me a tweet @CoopSciScoop! I’ve invited guests among the leadership of the Citizen Science Association, the European Citizen Science Association, and Citizen Science Network Australia. We’ll discuss how these panelists are helping organize practitioners across the many disciplines that engage the public in research.